180 Degree Turn Time32.73 sec. Initial HE Shell Velocity845 m./s. Initial AP Shell Velocity845 m./s.
. . . Firing Range3.81 km. Henri IV — French Tier X cruiser. Developed from the preceding project with enhanced anti-aircraft defenses, this cruiser carried 240 mm main guns designed in the 1930s. The ship featured a powerful propulsion plant and a very high speed. 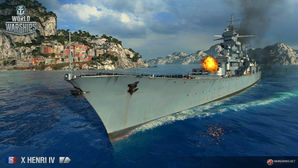 Proudly standing at the peak of the French cruisers tree, Henri IV takes her place alongside the Russian Moskva as the second “Big Gun” cruiser of Tier X. Henri IV’s key upgrades from her predecessor Saint-Louis are her speed (she is now capable of 35 knots in a straight line) and her new 3x3 240mm guns, which are 20mm bigger than those on Moskva. Her main battery shells have the highest armor piercing damage available to Tier X cruisers and tie with Zao's for the most high explosive damage. With their excellent penetration statistics, good accuracy, and great range, these guns, combined with the ship's amazing speed, make Henri IV very potent indeed. Several trade-offs must be made in order to squeeze guns of this caliber on to a cruiser hull: they have the second longest reload time, below-average shell velocity, and there are only nine of them. Henri IV is armed with a torpedo configuration that will feel familiar to veterans of the line: a single triple-tube 550mm torpedo launcher on each side of the ship, which boast a 9.0 km range married with decent reload time, low speed, and moderate damage. Henri IV captains have far fewer torpedoes available than captains of Hindenburg, Minotaur, or Zao and as such, they must be treated as a supplementary or last-ditch weapon. Henri IV’s base AA performance is lackluster, but her 57mm and 127mm guns have excellent range and decent damage when upgraded via modules and commander skills, with the latter fully benefitting from the Manual Control for AA Armament skill. Her AA is good enough for self-defense, but won’t truly be capable of defending friendly ships like most high-tier cruisers can. While Henri IV lacks a catapult to launch reconnaissance seaplane or catapult fighter, she comes with a choice between Defensive AA Fire ( ) or Hydroacoustic Search ( ) as well as default access to the improved French cruiser version of Engine Boost ( ) consumable that increases her speed by a massive 20%. Combined with the Sierra Mike ( ) signal flag, she is capable of reaching 43.9 knots... which is patently absurd for a cruiser. As with all high-tier cruisers, she also has access to Repair Party ( ). Captains have a choice between Defensive AA Fire for a massive increase in her AA performance, or Hydroacoustic Search for hunting destroyers, something the speed-demon Henri IV excels at. Similar to the rest of the French cruisers, Henri IV’s armor shouldn't be relied upon. She does have the second highest health pool of all Tier X cruisers, but her large size and poor concealment coupled with her limited armor can lead to an over-extending Henri IV being sent back to port very quickly. Henri IV’s speed can almost work against her, as she must avoid overextending at all costs, something that is a tad difficult in a ship that goes so fast. Overall, Henri IV poses a threat to nearly every ship class in the game, capable of mercilessly pursuing destroyers and slamming them with high-damage and accurate HE shells, able to re-position rapidly mid-battle to cover multiple fronts at once, equipped oppose enemy cruisers with her superior gun caliber, and still readily take on battleships with her excellent guns and her torpedoes. She is a Tier X cruiser worthy of addition to any captain's port. AP shells have excellent penetration statistics and she has the highest AP damage and ties with Zao for the highest HE damage. Fire chance of 22% on primary HE shells is unsurpassed among cruisers. Leagues ahead of all other cruisers at her tier in terms of speed; with Engine Boost ( ) active Henri IV is capable of reaching 43.9 knots, and can catch up to and even outrun high-tier destroyers. Mounts the biggest guns of Tier X cruisers (240mm), moving Moskva (220mm) to second place. Second highest health amongst Tier X cruisers. Armed with three torpedo tubes per broadside with decent range, speed, and reload time. Poor shell velocity on both HE and AP shells; the arcs make it harder to land citadel hits at long range, even against broadside targets. At long range, the penetration value of her AP shells lags behind Moskva. Fewer number of guns plus a longer reload time reduces Henri IV’s DPM capabilities. Limited torpedo capabilities compared to other Tier X cruisers armed with torpedoes. Second worst concealment value, after Moskva. While fast in a straight line, Henri IV bleeds a lot of speed in a hard turn. Lacks aviation facilities for a Spotting Aircraft ( ) or a Catapult Fighter ( ). As a Tier X ship, Henri IV has no additional modules to research. Slot 1: Main Armaments Modification 1 ( ). Henri IV’s guns are her lifeline and this reduces the chances of them being knocked out. Slot 2: Damage Control System Modification 1 ( ) is the best option, as Henri IV is a large target to planes, torpedoes, and HE shells. The preferred alternate is the rare module Engine Boost Modification 1 ( ) to give her a staggering 270 seconds (4.5 minutes) of uptime on Engine Boost ( ). Slot 3: Aiming Systems Modification 1 ( ) to improve the performance of her main guns, or AA Guns Modification 1 ( ) strengthen the outer envelope of her AA defenses, as while not as good as her peers, Henri IV’s AA has decent long range AA. Slot 4: Steering Gears Modification 2 ( ) is recommended to improve Henri IV’s handling. Alternatively, Damage Control System Modification 2 ( ) helps reduce how long Henri IV burns and floods. Slot 5: Concealment System Modification 1 ( ) is vital to allowing Henri IV to properly position herself without being spotted by enemy ships and to escape enemy ships should the battle turn against her favor. Steering Gears Modification 3 ( ) is also a viable choice here. Slot 6: Main Battery Modification 3 ( ) to reduce the reload speed of the main guns from 12.3 seconds to 10.8 seconds at the cost of turret traverse speed. Alternatively, Henri IV has the second longest base main gun range of 19.1 km, and Gun Fire Control System Modification 2 ( ) could raise this to a staggering 22.1km. Players who wish to spend doubloons can equip Henri IV with Type 20 camouflage that lowers her detection radius, reduces the accuracy of incoming shells, reduces her repair costs, increases her credit earnings, and increases the amount of experience she earns. Henri IV is actually the name of a pre-dreadnought battleship that was built in the late 1890s. No other ship has inherited the name ever since. This page was last modified on 5 March 2019, at 11:23. This page has been accessed 85,243 times.